Residents and businesses across North Miami Beach have Junk Removal Services provided by XS Trash. Respected across Dade County for our affordable rates and professional service, no job is too big or too small for our dedicated crews. We are dedicated to providing our clients with personalized service that is prompt and reliable, even doing our best to accommodate same day rentals when possible. Our full service jobs are carried out by our skilled professionals who will load and remove the debris from your job sit, leaving you free to focus on other parts of the project. Our large capacity trucks are able to haul up to 21 yards of debris, making your junk removal an efficient and timely process. 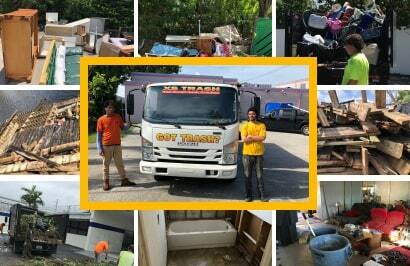 The team at XS Trash has been providing North Miami Beach with Junk Removal service that is known for convenient scheduling, and a team dedicated to prompt and efficient service. For those jobs requiring the use of a bobcat, the experienced operators at XS Trash can be hired for your project, eliminating the need to hire additional contractors to complete your job. Our ability to remove your unwanted debris makes us the top source for North Miami Beach Junk Removal services. Our team is trained to provide clients in North Miami Beach with junk removal services quickly and cleanly. Our cost effective rates and dedication to our customer satisfaction has made XS Trash one of the top providers of junk removal in the area. Call today for your FREE Quote and let us handle your junk removal needs. We are a licensed and insured North Miami Beach Junk Removal Junk Pickup & Hauling company.